Route 66, a journey: Insert patient here! Today a phone call to Neurosurgery Clinic. It's been three weeks since Dr. S. ordered an MRI of my cervical spine. Time for a little risk management with Valley Medical. Danny monitors our incoming mail. Thus it's not clear whether they've scheduled either the MRI or followup appointment. 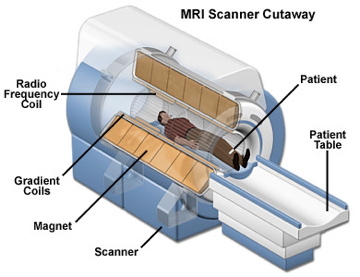 Unlike most brain injuries, a soft tissue injury in the spine will actually show up on an MRI. I'd like to show up for stuff that's actually effective. Again, on hold. The voices protest that my call is important to them. Then go figure, a dead competent woman comes on and answers all my questions. From Dr. S. (a resident on rotation from Stanford Medical School) it sounded like the timeline was a couple of weeks. Try 3 months. They're still waiting for authorization from my medical insurer. This should take 6-8 weeks (! ), which puts us at roughly the midpoint of that process. Assuming the MRI is a go, add 2 weeks to the followup with Dr. S.
She shares with me that lots of times an MRI gets scheduled and no one tells the patient so they don't show up. What a shocker... The King of Clubs can think what he wants about my brain; at least the idiot radar still works just fine. It's OK if this process takes a long time; not looking forward to a hard call. I... sometimes, I can't even. That's ridiculous. I hope they approve it!